Large line drawings on the ground arc nothing new. Throughout man’s history, we can find many examples of such drawings. There appears to be some aspect in all cultures that produces large line drawings on the earth, which can only be viewed from the air. Most archaeologists believe that these various cultures were paying respect to their gods. 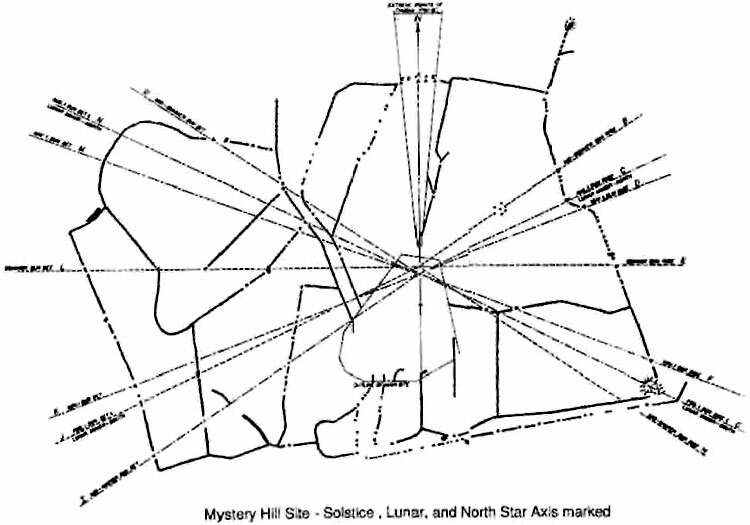 Many ground drawings represent known astronomical observatories for studying the stars and the seasonal changes for an agricultural based society. Still, other theories speculate about landing fields and directional markers for interstellar space craft for extraterrestrials who might have visited the plant Earth thousands of years ago. 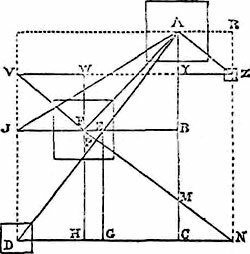 One thing is sure, large ground drawings have been a part of the history of mankind. One of the most famous of the ground drawings are the Nazca lines of central Peru. Archaeologist believe that the Peruvian Indians had the ability of hot air balloon flight, which was needed in viewing the layout of these lines. The lines take on the shapes of many types of animals and symbols, which may represent constellations and aspects of the early Indian culture. Another belief is that these ground lines were landing fields for ancient astronauts. Near the Nazca lines are ancient Peruvian cities, where religious rites were carried out using mind altering drugs. It is possible that these lines were associated with the religious rituals of a society involved in altering states of consciousness. Scientist still have not fully determined the exact reason for the Nazca Plain line drawings. 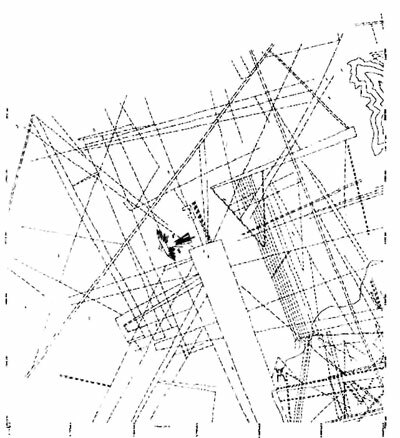 Perhaps, as we will see, large ground drawings always seem to have more than just one meaning. In many places around the world are megalithic sites, which were apparently used in the rituals of ancient religions. They were possibly involved in early sun worship, since most are aligned to the sun and moon positions throughout the year. Another example is Sarmizegetusa, a prehistoric monument in Rumania. Still, another site is the circle of post holes at Cahoka, Illinois. Found outside St. Lewis, it is one of American’s oldest known Indian astronomical observatories. Another well documented site is Mystery Hill near North Salem, New Hampshire. 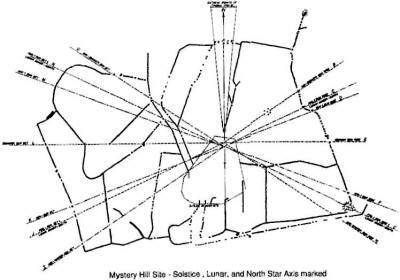 The solar alignment of the Mystery Hill site can be dated from 1500 B.C. 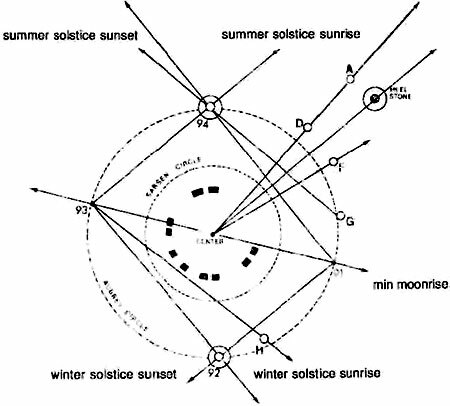 Both sites are aligned to the summer and winter solstice. The most famous of the megalithic sites is Stonehenge. It is definitely a seasonal astronomical observatory for the moon and sun positions. 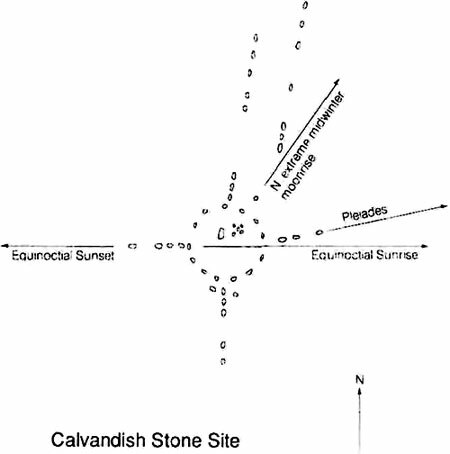 The following illustrates the axis of these positions in relation to the marker stones of Stonehenge. 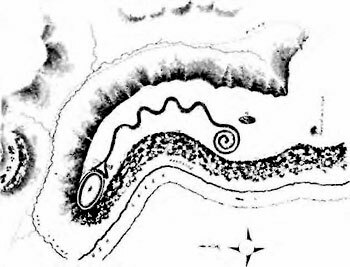 The serpent earth mound in Adams County, Ohio is considered the most famous of the ancient American Indian earthworks of North America. Archaeologist have conjectured that the motif of the serpent swallowing the egg depicts an astronomical event of religious significance. It looks a lot like a sperm cell connecting with an egg cell at conception, so the motif may have something to do with a fertility ritual. Though, it is hard to believe the early American Indian could view the microscopic structure of cells at fertility. 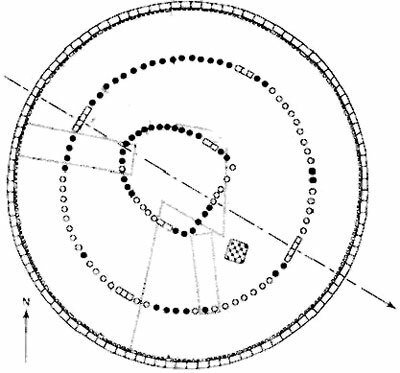 In the book Archaeastronomy in pre-Columbia America, it is suggested the effigy mound-sand other earth works were designed on the pattern of the stars and constellations. A traditional image of a lunar eclipse in Asia is the moon being swallowed by a serpent, and this may be part of the meaning of the Ohio mound. The seven loops of its body and the tightly winding tail is seen as a representation of the seven stars in Ursa Minor and their annual rotation round the pole star. A more esoteric interpretation of the loops would be the seven levels of the universe or seven heavens as spoken of by many religions around the world, with the mark of Aries at the top of the seventh heaven. The symbol illustrates the principles of the chakras and the sephorit from Hindu and Jewish mysticism. The Aries symbol is clearly seen within the serpent head motif. It represents Asmodeus, the guardian of the treasure of Zion or Solomon, as presented in Jewish history and folklore. There are even theories speculating that the serpent earth mound in Ohio was built by the fabled Lost Tribes of Israel. As far back as ancient Egypt, we can find the layout of large shapes that can only be distinguished from the air. The temple of Isis-Osiris, as presented in the book Living Architecture by J. L. DeCenival, has the shape and dimensions associated with a man. This illustrates that an architectural structure may be designed to represent an alternate meaning other than a traditional building. The Gaza Pyramid Complex yields an interesting triangulation. 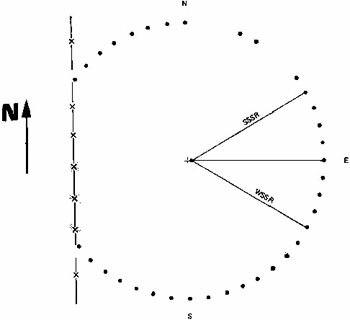 Lines of sights for finding the winter solstice and maximum southern position of the 18.61 year cycle of the moon can be triangulated around the three pyramids. Soviet space scientist Alexander Abramov found that the three large pyramids on the Giza plateau are arranged to an Egyptian geometric configuration called the abaka.